The quilts in this book are made by a collection of different quilters, each of whom is showing off some of Robert Kaufman’s Kona Cottons. The one on the cover caught my eye particularly, and although a full sized one would have been fabulous, I just didn’t have enough fabric or time to hand, so I decided to go mini and shrunk it to 1/3 of its original size. Using my Kona colour card that I won at the same times as the book (thanks to Candi) I was able to see that although I didn’t have the exact same colours, other than the snow and the curry, I had fabrics that were just 1 shade different in one direction or other, so I gleefully hauled them out. There is a diagram that shows how all the bits are joined together, so I stopped reading any written instructions at that point, and just used the photo, which all went well until I went to put the 2 sides of the blue box together, only to find I’d cut the bottom cross bar 1/2″ short on the top side (totally my fault for forgetting to add it back on again), which in turn had an effect on the white bit to the right, which in turn had an effect on the whole block to the right of that *sigh*, so had to do some unsewing of 3 bits to sort that one! Well, there may be a few of my pebbles could stand a bit of grout between them, but I don’t think I did too badly. The only thing was that having done the smaller white background and the white centres of the boxes, my forearms and wrists were in agony. I’ve had RSI before, and this hit both arms in a oner – ARGH! So on the Saturday night I marinated them in ibuprofen max-strength gel, switched to projects that wouldn’t put any strain on them, and on the Sunday I donned a couple of what turned out to be a small collection of splints I’ve built up over the years from the NHS (they’re not returnable, they can get horribly sweaty and grubby) With my quilting gloves over the top it looked quite comical, but it did the trick and I got through the remaining pebbles with no further incidents. The only conclusion I can draw from this is that I was resting my forearms on the quilting table a bit too heavily and the vibrations during sewing did not help. I did the wavy stitch in the blue section using a stitch just that shape on my machine and my regular walking foot. Finally in the pink section I took some drawings that Trudi had kindly loaded into Flickr for me, and another Leah Day tute, and got down to it. To participate in the month-long contest, just link up any project you’ve made from a pattern in a craft book. That easy! 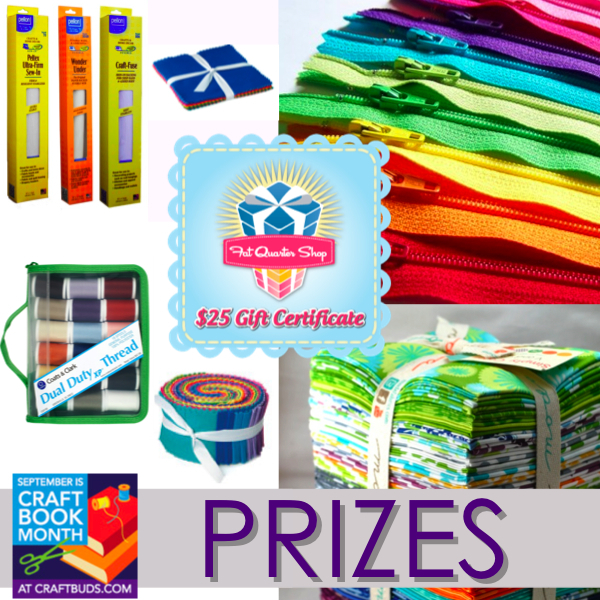 One entry per person, and all craft book projects must have been completed in 2012. Just create a new blog post or Flickr photo (dated September 1, 2012 or later) and link back to Craft Buds in your post or photo description. Oh wow, it's fabulous! Your quilting looks just amazing. THANKS KATY! NEAT NEAT PROJECT! My mind wandered a bit at the Maths involved, but it was definitely worth it your mini quilt is lovely. So gorgeous! And your FMQ turned out great – I need to be as brave as you in that area. Also love that you made this as a mini. Thanks for sharing! You finished in time! Whoot! Stunning, Katy! I would have been so nervous to quilt inside those solids, but you did a fantastic job–thanks for making it look easy! Just fantastic! I love minis for the quick gratification (well, quicker than a full size quilt, but I couldn't have done the piecing in less than 3 weeks in between everything else, let alone the fmq.). Applauding! This turned out wonderfully! I like how you approached the math too. That's exactly what I would have done. 🙂 Your quilting is terrific! Your mini is perfect – I love it! Katy, You did an awesome job of quilting this little beauty of a quilt. Great review, it sounds like a great book. Love that mini, you should do a whole series now! Gorgeous quilt! I haven't seen this book, but seeing as I have fallen in love with solids, it sounds like one I need to get! I think my mind imploded with the maths, (1/3 of 1/4", really!) but I love the mini quilt!! Lindo e perfeito,parabéns.Acho que quero um desse…. I cannot believe this is the second quilt you have done FMQ on…oh how that makes me think there could be hope for me! I really need to learn! oh, what a gorgeous quilt!! And that FMQ looks fantastic! WOW!!!! 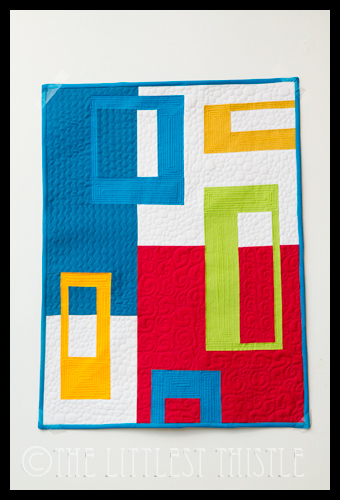 Love the colors… and the quilting is really nice too! When seeing your project in the blog hop and in the linky party, I wondered why it looked familiar to me – now after reading your post I know that it's because it's a cover quilt ;o) I don't own the book but after reading your review I will add it to my christmas wish list! Thanks for sharing! I've wanted to make this quilt since I saw it on the cover. You did a fabulous job. The quilting is amazing as well!